India is a unique land, and so are its festivals. From Holi, when the entire country is doused in colors, to Diwali, when splendid fireworks illuminate the night skies, every festival celebrates its mythology, traditions and customs. Simultaneously, fairs or "melas", as they are locally called, highlight the local culture of the land in colorful and expressive ways, emphasizing the prevailing folklore and history of the region. Here are some of the fairs and festivals in India which display pomp and magnificence on a grand scale. 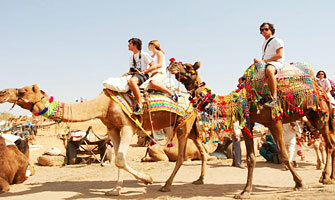 The Pushkar Fair, or Pushkar Mela, as it's known locally, is the world's largest camel fair. This weeklong fair, held at the time of the "Kartik Purnima" full moon, is as lively as ever. One of the greatest traditional "mela" in the country, it witnesses a congregation of more than 11,000 camels, horses and cattle. This massive gathering attracts over 400,000 people over a period of fourteen days. Competitions such as 'matka phod', 'longest moustache' and 'bridal competition', draw a large number of people. A recent addition to this festival is the exhibition cricket match held between the Pushkar local club and a team of foreign tourists. 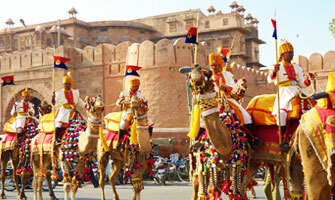 Bikaner Camel Festival, organized by Government of Rajasthan, celebrates the "king of the desert." Almost all the activities held here– camel races, camel milking, fur cutting design, best breed competition, camel acrobatics and camel beauty pageants, honor its hardiness and tough spirit. The camels, adorned with the choicest of jewelry, along with the colorful bridles, bejeweled necks and jingling anklets throw the audience into a trance. The stalls displaying an amazing variety of souvenirs, offer great shopping opportunities. Besides, one is treated to the taste of local cuisine from the various food stalls. The Desert Festival of Jaisalmer showcases the best of Rajasthan's society and culture, and attracts a large number of visitors, both domestic and foreign. Held over a period of three days, it consists of turban tying competitions and camel races, besides other cultural events. The men and women of Rajasthan bring their history to life by singing ballads of valor, romance and tragedy. The moustache competition in particular, is a personal favorite amongst foreign tourists. Marvelous dance performances performed by the Gair and Fire dancers win the hearts of everyone present. 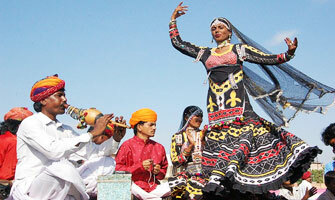 Rann Utsav, organized every year in Dhodro village in Kutch district, showcases the folk culture and colors of Gujarat. Held on the great white salt desert called Rann of Kutch, it is marked by several events that keep the visitors entertained. From stargazing to sightseeing, this festival is a unique combination of sightseeing, adventure and entertainment. Witness the lovely folk dances and music or enjoy an aerial view of the entire proceedings from above through a hot balloon ride, the options are many. One can also take away lovely souvenirs at this event, apart from other valuable items like handcrafted articles, silverware and intricate Kutch embroidery. Goa Carnival, celebrated in Goa since the 18th century, is a time for feasting and merrymaking just before the 40 Days of Lent. This festival is marked by celebrations in cities and villages all across Goa. A major parade is held, which consists of floats, entertainers and dancers. The festivities usually begin around 3pm and last for about 3hrs. The celebrations culminate with the famous Red and Black Ball which is usually held at the Club National in Panaji, on the evening of the last day. 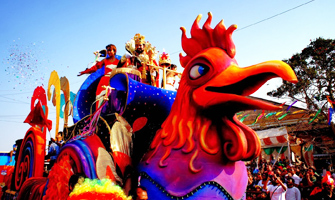 This carnival, which is exclusive to Goa, was introduced by the Portuguese who ruled Goa over five hundred years. The Konark Dance Festival celebrates Indian heritage with various dance forms. As the sun sets, the open air auditorium comes to life. The energy of musical beats and rhythmic movements under the starlit sky proves to be a true cultural feast. A celebration of Bharatnatyam, Chau Dances, Manipuri, Kathak and Odissi; the festival truly comes as a memorable experience. The sound of Ghungroo bells, flute, musical instruments and the soft melody of the waves makes it just magical. The festival is a platform for the performing artistes and the dance connoisseurs both. Paying tribute to the classical dance forms of India, Khajuraho Dance festival is a celebration of Indian heritage. Every year the UNESCO World heritage Site of Khajuraho Group of Monuments, hosts the fiesta of spectacular performing arts of India. Attend performances of classical dance forms- Bharatanatyam (Tamil Nadu), Kathak (North, West and Central India), Kathakali (Kerala), Kuchipudi (Andhra Pradesh), Odissi (Odisha), Manipuri (Manipur), Mohiniyattam (Kerala), and Sattriya (Assam). Watch artists perform dressed in beautiful attires with elegant expressions and intricate hand gestures to melodious beats of classical musical instruments. The dance performances narrate extracts from ancient mythological texts. 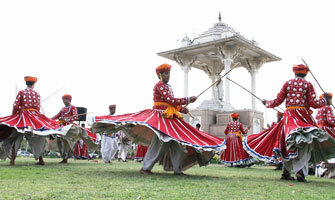 The entire city of Jodhpur revels in the celebrations of Marwar Festival. This two day festival held every year in the month of Ashwin, honors the gallant spirit of Rajasthan's heroes and warriors. 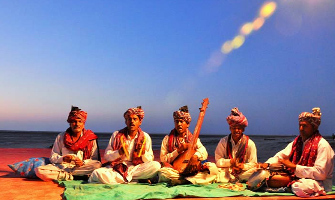 Also known as the Maand Festival, it celebrates the romantic lifestyle of Rajasthan's rulers through folk music. The various folk songs transports the listener into the days of yore, when chivalry was the ultimate code and honor the highest virtue. Some of the other crowd pullers are longest moustache competition, turban tying, tug of war, Matka Race, traditional dress competition, to name a few. 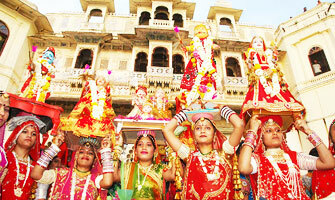 Mewar Festival is celebrate to welcome the onset of spring season in Udaipur, Rajasthan. 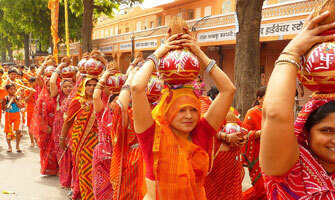 The womenfolk of Rajasthan participate in this festival with great enthusiasm, as they play a primary role in it. During the main ceremony, the women assemble to dress the main image of Isar (Lord Shiva) and Gangaur (Goddess Parvati). After dressing them fondly, they carry the image in a traditional procession through various parts of the city. Once the procession reaches the Gangaur Ghat at Pichola Lake, the images are transported into special boats and immersed in the deep waters of the lake. This ritual is succeeded by the performance of various cultural songs and dances, followed by an incredible display of fireworks that conclude the ceremony. 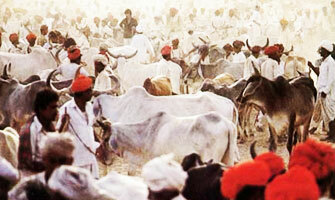 Nagaur Fair, also known popularly as the Cattle Fair of Nagaur, is the second biggest fair in India. Approximately 70,000 bullocks, camels and horses are traded every year by the cattle owners here. The animals are decorated in every imaginative way, while their owners flaunt their long moustaches and colorful turbans. Some of the other attractions here include the "Mirchi Bazaar (the largest red chilli market of India)," sale of wooden items, iron-crafts and other camel leather accessories. 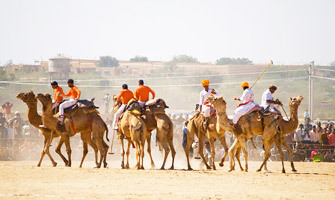 Several sports, ranging from tug-of-war, camel races to bullock races, attract a large number of participants. Gangaur Festival is celebrated in honor of Gauri – the goddess of abundance, and the consort of Lord Shiva. Women have a central role to play in the festival. While the married ladies pray for the well-being and longevity of their husbands, young girls pray for a spouse of their choice. During the afternoon, at an auspicious hour, a procession by women is taken out to a well, garden or tank with the images of Isar (Lord Shiva) and Goddess Parvati placed on their heads. Songs marking the departure of Gauri to her husband's house are sung. 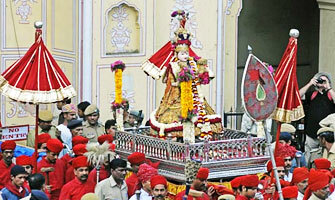 The procession makes its way back after offering water to the image of Gauri, which is placed in a backward position for two days. On the final day, the images of both Lord Shiva and his consort are immersed into the waters of a tank or well. 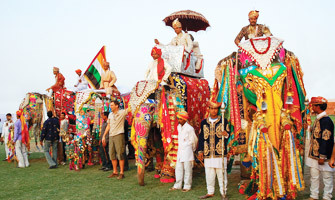 Elephant Festival of Jaipur is a "colossal" festival which is held every year on the full moon day of "Phalgun Purnima." For this festival, elephants are pampered and decorated generously. Clothed with embroidered velvet rugs and parasols, they are an amazing site to watch. Their enormous bodies are painted with traditional Indian motifs, besides the ear danglers and colored brocade scarves which adorn their necks, while gold and silver bracelets dangle from their tusks. Some of the defining features of this festival are elephant polo and a tug-of-war between 19 men and women pitted against an elephant. Apart from this, this festival also witness a grand procession of chariots, lancers of horses, palanquins and camels. Mount Abu – Rajasthan's only hill station, provides respite not just from the excruciating heat of the summers, but also serves as the venue for a two day summer festival. Starting on the day of Buddha Poornima, this festival celebrates the vibrancy of Rajasthan's culture over a period of three days. Soulful ballads, which honor the chivalrous and romantic spirit of the people, are sung, followed by some dynamic folk dances like Gair, Ghoomar and Daph. However, the main attraction is the Sham-e-Qawwali, where the audiences are treated to some incredible performances by folk singers. Other added attractions are tug of war, skating races, CRPF band show and boat races on the Nakki Lake. "Teej" is a generic term for all the monsoon festivals celebrated in the western and northern states of India. When the first rains of the monsoon hit the ground, it sends smiles through people's faces. Birds, plants and animals - everyone joins in the celebrations. Women dance, sing, apply henna on their hands and feet, wear brightly colored saris, and welcome the season in the company of friends and relatives. One of the most common images symbolizing this festival is "women playing under the trees and swinging merrily." An elaborate procession is taken out in honor of Teej Mata or Goddess Parvati, which begins from the City Palace and is witnessed by a large number of spectators.